This simple yoga sequence will help you unwind, getting ready for a rejuvenating night's sleep. Our busy modern lifestyle demands constant attention from us. We wake up to our phones, watch the news with our morning coffee, and check our email every few minutes. We’re constantly engaged outward. Is it any wonder that when the lights turn off, our brain turns on a barrage of thoughts that can rob us of sleep? To combat the bedtime ‘monkey mind’ state that keeps you awake, incorporate this yoga sequence into your nightly routine. Yoga postures (asanas) are designed to bring the mind, body, and breath in alignment. By practicing yoga regularly, you’ll start to feel a greater sense of spaciousness in your life, both physically and mentally. These eight poses combined with deep breathing will help release tension in your body, lower your stress levels and calm your mind. Give yourself 15-20 minutes for this sequence and notice how your body feels in each pose. Always listen to your body, especially if the poses are new for you. All poses can be done on your mat or in bed – your choice. Sweet dreams! 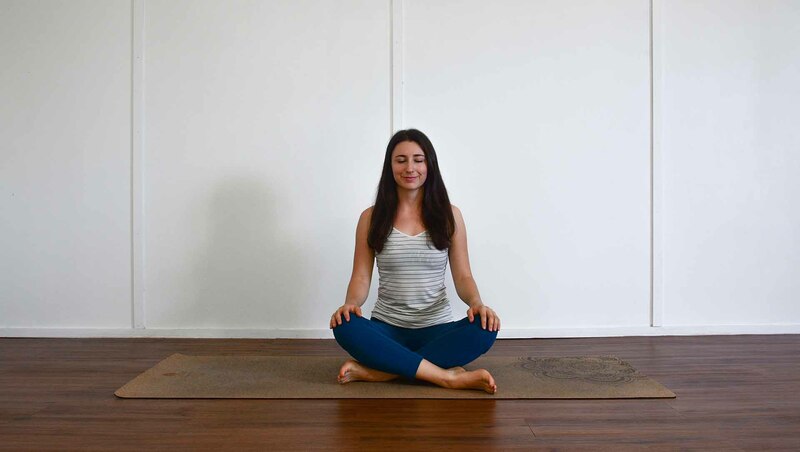 Begin in a comfortable seated position and rest your hands on your knees. Draw your shoulder blades down your back, opening up through the chest. 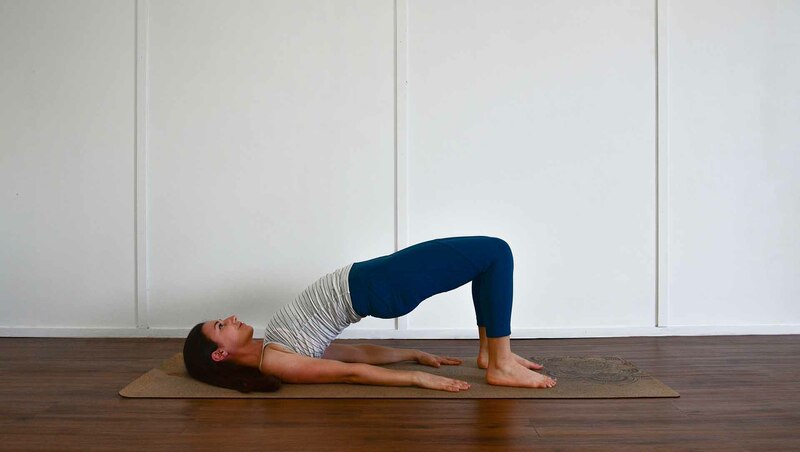 Actively lengthen through the spine and gently close your eyelids. If you’d like, you can add in a few slow neck and shoulder rolls to ease any tension in the area. Let go of anything that happened during the day. Let go of any to-do lists or expectations you have for tomorrow. Stay here for 6-8 deep, mindful breaths. You can open your eyes or choose to leave them closed for the remaining postures. Bring your left leg across your body. Find that tall spine once again, supporting yourself with your left arm. Inhale as you lift your right arm above you. As you exhale, twist to the left, resting your right arm on your left leg. Keep your hips level. Notice how the twist naturally changes as you breathe in and out. Stay here for three breaths, and then slowly unwind. Repeat on the opposite side, bringing your right leg across your body, and twisting to the right. Allow yourself to lie back down on your mat, bringing the soles of your feet together. Let your knees fall open to either side. This deep hip-opener stretches the inner thighs. Butterfly pose is a particularly peaceful, restorative posture that is best experienced with the eyes closed. You can use your hands to press down gently on your legs, or let your arms rest on either side of your body. For a more supported version of this pose, place a pillow or bolster under your knees. Stay here for 4-6 breaths. Bring your knees up, planting your feet down hip width apart. Pressing your arms into the mat, start to lift your hips up, starting from the tailbone. Engage your thighs and actively push the mat away from you. You can stay here or interlace your hands under you to open up through the chest. Spend 3-4 breaths here, then release your hands and lower your spine down, vertebrae by vertebrae. Straighten out your legs in preparation for the next pose. Bring your right knee in toward your chest. Keeping both shoulder blades firmly pressed into the mat, allow your knee to drop over to the left side. You can use your left hand to apply light pressure on your right leg, but avoid forcing your knee down. Use each inhale to elongate your spine, and each exhale to settle deeper into the twist. Notice how the pose shifts as you breathe in and out. After 3-4 breaths, bring your knee back up and straighten your leg down on the mat. Repeat with the opposite leg. Bring both knees into your chest, giving yourself a hug. Reach past your knees and grip your ankles or feet. Let your upper body and head relax down to the ground. Take a few breaths here to rock and roll around, whatever feels good, giving your lower back a nice massage. Imagine yourself as a giggling baby, beginning to playfully explore the joys of movement. Release your legs down to the ground. 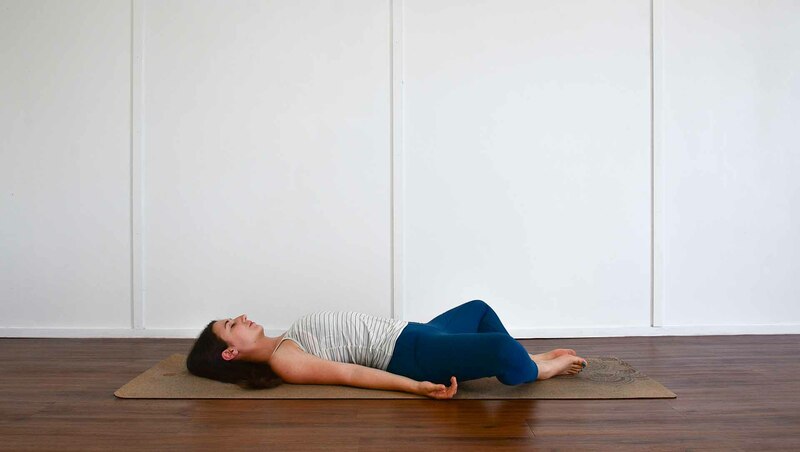 This is a great restorative pose for the end of the day, especially if you’ve spent most of it on your feet. Lie down on the ground close to the wall, and bring your legs up. Depending on how flexible your hamstrings are, move further away or closer to the wall until you get a comfortable stretch. Gravity will encourage blood flow back to the upper body and help reduce swelling in the legs. You feel fully supported by the ground and the wall. Take time to think of three things you’re grateful for today. Stay here for 1-2 minutes. Moving away from the wall, lie back flat on your mat and close your eyes. Settle into a comfortable savasana pose with your feet slightly apart and your hands near your hips with your palms facing up. Release any tension in your face, your shoulders and your back. Allow your arms and legs to relax. Your hips feel heavy, as if you’re sinking into the ground. You feel grounded and calm. Focus on the rise and fall of your belly as you breathe. If your mind starts to wander, count 1-2-3-4 during each inhale and 4-3-2-1 for each exhale. Stay here as long as you’d like – you might just fall asleep! Ena Music is a yoga instructor with over 10 years of experience practicing yoga. She trained with My Health Yoga in Brisbane and teaches regular classes at MyDrishti Yoga Studio.